There are a lot of writers. It’s a great thing to be. What’s better? Being a paid writer. Sure, even if I knew that no one would ever read a word I’ve written, or that I’d never get paid a dime for it (for sure the fate of Nightfall), I’d still write. I love it. But, if I could make a career of it, all the better. How does one become a paid writer? Well, that’s still a question that I’m trying to answer. The first thing I ever published was a poem in 6th grade. Now, I’ve got no idea where it’s published, and I didn’t make any money on it, but it’s nice to know that it’s out there somewhere. The second thing I published, I did get paid for. I think I made a little over $1. It was an article on Yahoo! Voices about starting a photography business. (I did photography professionally for about 6 months. It was fun, but not worth the effort. You can love things sometimes,but just not love them enough). The next article I wrote was on Travidition about my trip to Yosemite. I didn’t get paid for it. But, whatever, I was trying to get out there. Just like this blog. I don’t make money. But I get my writing out there. I also published a children’s book: Once In A While, Everyone Loses To be honest, I bought a tablet thing for my Photoshopping, and it came with this sketching program and then I was like “I’m going to write a children’s book” and the next day it was done. It looks better as a physical book than it does as an e-book. I did the art, and the story. Everyone who’s seen it really liked it. Between the Kickstarter I’ve put up for it and sales on Amazon, I think I’ve sold about a dozen. And I’m actually proud of that. It’s not going to be my claim to fame, never it’s intention. But it is the first real book I ever made and put out to the world. And people like it. So, what’s that picture at the top? 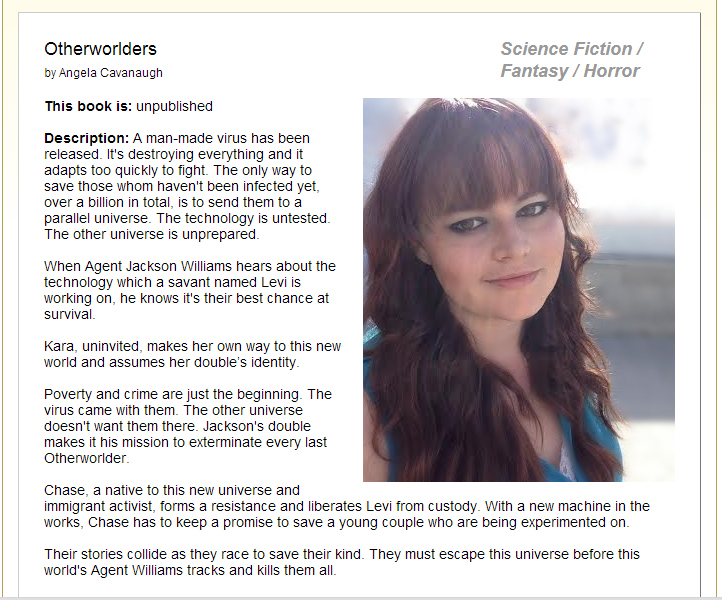 That’s my entry of Otherworlder’s into the Amazon Breakthough Novel Award contest. The contest is open until early March, or until they’ve gotten 10,000 entries. There are several rounds to the competition, and they whittle it down to just 2,000, and then down again and again and again. Top prize is a $50,000 advance. Second places get $15,000. Is it guaranteed income? No way. But I’m still excited to be getting Otherworlder’s out there. It’s a start. I also wrote a short story and submitted it to Lightspeed Magazine. They pay a whopping $.08/word. Doesn’t sound like much, but it’s a lot better then some of the other things I’ve seen. I really hope they accept my story. If they do, it’d pay about $400. Not too bad for something I spent a couple days on. Believe it or not, there are a lot of places out there looking for content. I found these two contest by accident. I was just browsing around Amazon when I found last year’s winner, and discovered the contest existed. Just in time to enter it, too. The Lightspeed contest I found while I was looking at the SWFA website. They have a lot of resources there. And under their membership requirement section, they list a bunch of places that short fiction is published. Figure that’s a good free resource to find places that you can submit to. Another good place to find people looking for content is Duotrope. It does cost, I think $5/mo, but it provides you with current information about what places are looking for content, who’s having writing contest, and what they’re each looking for. Of course, you can look on craigslist. Just be careful. There are some companies out there promising that you can get rich, or at least make a living, working from home and that they’ll provide you with the assignments because all these websites need content…. it’s a scam. They just tell you where to look to find jobs. None are guaranteed. In fact, they have no affiliation with the people you are submitting to. It’s nothing that you couldn’t find yourself, for free, and probably about as easy. So, get out there and publish! Find somewhere and just do it. Build your brand. Prove you can. Get some credits under your belt. Take a risk and enter a contest. Submit to periodicals. Yeah, we all want to publish a novel. But sometimes, you gotta start somewhere. Stephen King got his start in literary magazines, according to his book On Writing as did a lot of great, successful authors. And people really do make a living freelance writing. No reason not to be one of them. Thanks for following my blog. I entered and lost two contests this year: Writer’s Digest and the Tennessee Williams Literary Festival fiction contest. Found out about them through a Google search. I was putting together my book proposal, got to the part about my platform, realized I didn’t have one and thought listing the contests I won would be something. Had to pay to enter each, but the cash prizes if I won were great, plus the chance to attend a Literary Festival of my favorite playwright in New Orleans. Oh well. Rereading my entries, I understand why I didn’t win. My characters were too two-dimensional and so obviously autobiographical, in one case. that I don’t blame them for passing. It was a good experience, my first actually, writing fiction, if you don’t count my Alaina series, which is under the fiction section of my blog, if you are interested. Not done yet, BTW. Anyways, I digress. Thanks for the follow. I check yours out again.